Banners that make your message clear! Due to their durable, lightweight, and cost-effective design, vinyl banners are becoming an increasingly popular marketing tool for businesses in just about any industry. Thankfully, Blue Barrel Signs has experience providing local organizations with vinyl banners in Bend, Oregon. Read on to learn more about different types of vinyl banners and what they are good for. Digitally printed banners and cut vinyl banners are the two main kinds of vinyl banners. Cut vinyl banners usually have simple shapes or text that are cut from a sheet of vinyl adhesive film and attached to the vinyl banner. Since it is easy to change out the cut vinyl lettering to update the time, location, or date of an event, they are perfect for promoting events you hold on an annual basis. Compared to purchasing a whole new banner each year, updatable cut vinyl banners are much more affordable. 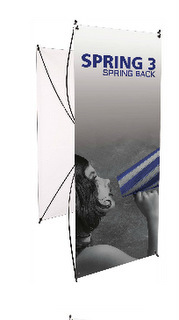 Retractable banners have many uses! Your graphics are basically printed right onto the vinyl banner when you choose digitally printed banners. This process allows for more detail, which is ideal for high-resolution photos and images. Digitally printed banners are your best solution when you want a colorful banner with a range of style elements. Both banner types are faster to fabricate than most other signs. This is important because signage can sometimes end up on the backburner as you prepare to open a new business. Banners can be printed and installed in time for your grand opening as you wait for more permanent signage to be ready. What Are the Best Uses for Vinyl Banners? Vinyl banners help you advertise! Show Your Appreciation for Bend – We live in a pretty awesome community. Showing a little appreciation for the town or neighborhood you work in can go a long way in building your name recognition. 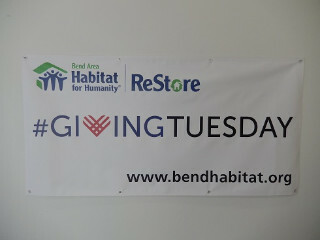 One inexpensive way to thank your donors, sponsors, and clients is with cut vinyl banners. Promote Your Bestselling Products – If there are new products that you want to tell consumers about or you just want to get the word out about your most popular items, digitally printed banners can display the product in sharp detail. Advertise Seasonal Sales – We are nearing the end of the year’s biggest shopping season, but there are plenty of other times of the year that you can tie into special deals. For instance, you might consider promoting a Valentine’s Day sale. 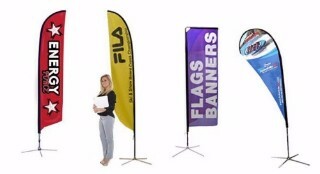 Boost Your Brand at Events – Take your corporate colors, logo, and other branding with you as you exhibit at trade shows, conventions, expos, and other events. Banners are easy to set up, hang, and transport. If you would like to learn more about how you could use vinyl banners in Bend, Oregon, contact Blue Barrel Signs today for a free quote!